Yeah, that's a lame attempt to sneakily avoid saying "tattoo." 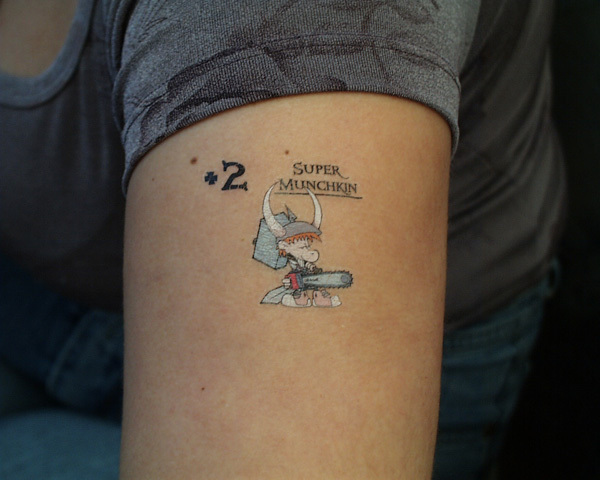 But Munchkin Temporary Tattoos aren't lame or sneaky. You can pick some up from Warehouse 23 in a pack of 10 for just $4.00! Each full-color tattoo is, of course, temporary. Moisten the skin, then press the image on. It'll wear off in a couple days of normal washing, or can be scrubbed off easily. And yes, that number is the bonus the "tat" gives you in a Munchkin game.